Nevis’ Nisbet Plantation Beach Club is beginning the New Year with two honors naming the intimate Nevis resort among the top resorts in the Caribbean and the world. In the CondÃ© Nast Traveler 2014 Gold List of the Worldâ€™s Best Places to Stay, Nisbet Plantation received an overall score of 94.9, ranking #5 in the Caribbean and Atlantic and the top-ranked resort on St. Kitts and Nevis. Additionally, Nisbet Plantation was honored for the third year in a row in the CondÃ© Nast Traveler Platinum Circle. The Platinum Circle recognizes â€œGold List superstarsâ€ and consistency in excellence for properties that make the Gold List five years in a row. 2014 marked Nisbet Plantationâ€™s eighth appearance on the list. 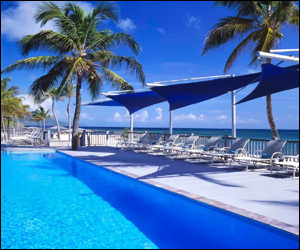 In Travel + Leisure, another prestigious travel magazine, Nisbet Plantation Beach Club was recognized in the T+L 500 list of the World’s Best Hotels for 2014. Nisbet Plantation received an overall score of 94.67, the highest score on the two-island nation and earning the resort a No. 3 spot within the Caribbean. Both awards are published online and featured in the January 2014 issues of the magazines, which are on newsstands now. Congrats, can’t wait to arrive for Valentine’s Day! It will be our 15th anniversary, we were married at Nisbet 15 years ago on Valentine’s Day. Thanks to Don Johnson and his wife for taking such good care of us.